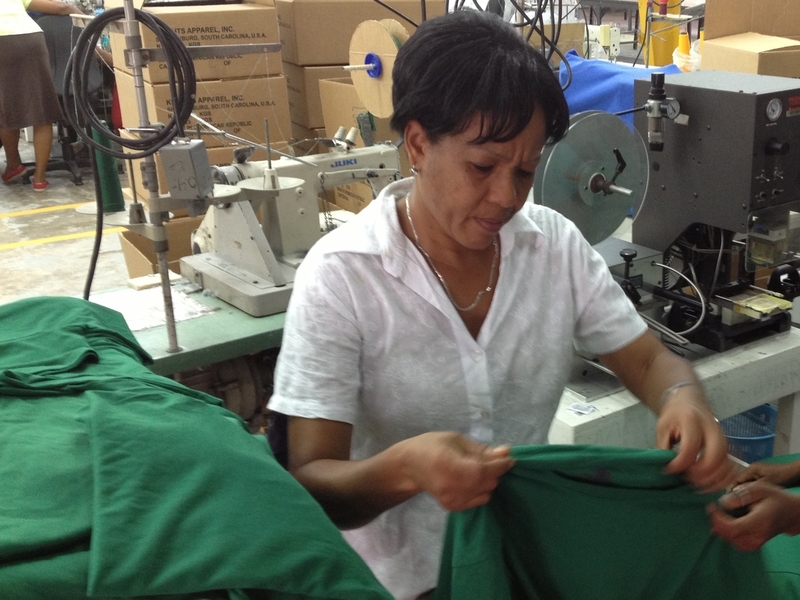 Can This Dominican Factory Pay Good Wages And Make A Profit? : Parallels Textile workers in some poor countries like Bangladesh can make less than $100 a month. One factory in the Dominican Republic is trying something different: It's paying workers $500 a month. The company has yet to break even after three years, but the CEO says the business is growing rapidly and he believes it will be profitable. 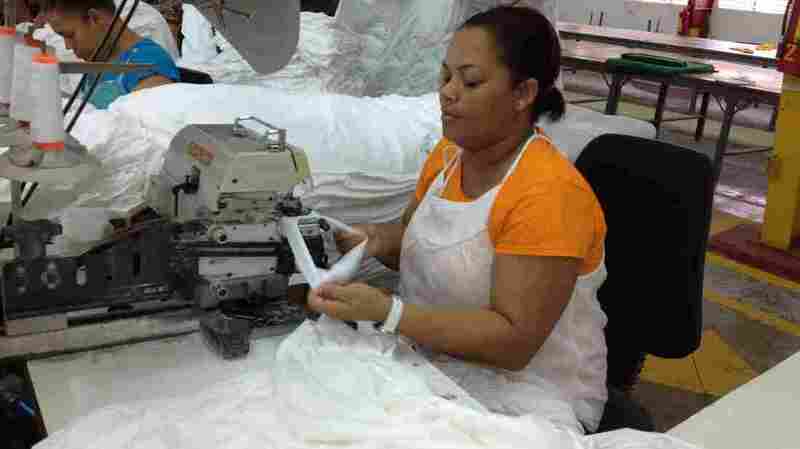 Aracelis Upia Montero works at the Alta Gracia garment factory in the Dominican Republic. She says she was desperately poor before she began working at the factory, which pays much higher than usual wages. "I'm now eligible for loans and credits from the bank because I earn a good salary," she says. Aracelis Upia Montero bounds through the front door of her wood and cinderblock house, calling out for her children. The bubbly 41-year-old Montero — whom everyone calls Kuki — proudly shows guests around her cramped single-story home in Villa Altagracia in the Dominican Republic. Montero points out her new living room furniture. In the past couple years, she has added two bedrooms and now has indoor plumbing. She has also built a little apartment at the end of her dirt driveway that she rents out. "I was able to save money very quickly, and I could get a loan from the bank," she says. "I'm now eligible for loans and credits from the bank because I earn a good salary." Three years ago, she never would have imagined life could be so good. The single mother says she was desperately poor, didn't know how she was going to feed her four children and had little hope for the future. Workers at Alta Gracia garment factory make around $500 a month, far above the industry average, though the company has yet to break even since it opened three years ago. Its apparel is sold at hundreds of college bookstores in the U.S. But life changed dramatically when she got a job at the Alta Gracia garment factory, named after her hometown. She spends her workdays sewing T-shirts and sweatshirts bound for American colleges and universities. The facility, which opened in 2010, is a long way from the picture of despair that's often associated with garment factories in many poor countries around the world. Alta Gracia is bright and airy. You can watch the seasonal rains drench the lush gardens through the factory's large open door. Employees chat and laugh among themselves. Lively music, chosen by the workers, blasts from speakers. Occasionally, workers will break out in song. The roughly 130 workers make a little more than $3 an hour, or about $500 a month. In addition, the employees received benefits and are allowed to unionize. By comparison, a typical wage at similar factories in the region is less than $1 an hour. The Alta Gracia wages are almost unheard of in the global garment industry. In Bangladesh, for example, several recent reports put the average wage at between $40 and $64 a month. Now here's an important point: Alta Gracia has yet to break even. But CEO Joe Bozich says business is growing swiftly and he believes it will become profitable. Bozich says he developed the company for both personal and business reasons. Several years ago, he was diagnosed with multiple sclerosis. He says it made him rethink his priorities, especially when he started meeting American college students who were actively campaigning to improve labor conditions in the garment industry. "When I heard their passion consistently over the years, it started convincing me that if we made this initiative a reality that could be successful, that the consumer would support it," he says. Bozich worked closely with the Washington, D.C.-based Workers Rights Consortium to devise a model company that could pay and treat employees well and still make money. The organization monitors garment factories making apparel for about 175 colleges and universities in the U.S.
Maritza Vargas heads the factory's union. "There is a quote that reads, 'From nice dreams, you wake early,' " she says. "But we don't think like that at Alta Gracia." Bozich set up in the Dominican Republic, taking over a factory abandoned by a South Korean company, BJ+B, that made baseball caps for retailers such as Nike and Reebok. The factory closed in 2007. Scott Nova, executive director of the Workers Rights Consortium, says 3,500 Dominicans lost their job. "The industry had come to view the Dominican Republic, with wages of about 80 cents an hour, as too expensive a place to make apparel, relative to low-wage Asian countries," Nova says. He says the South Korean firm moved its manufacturing to Vietnam and Bangladesh. Maritza Vargas, a union activist, was among those who lost her job. She says she couldn't stop crying when she heard the news. There were no other employment opportunities in town. She couldn't believe it when she heard a new factory was opening up and willing to pay high wages. "Here, nobody makes that kind of money, not even a professional who has a university degree earns that kind of salary," she says. Vargas' days are full working at the factory and heading up its union. She also takes time out for Internet conference calls from all over the world with people who want to know more about Alta Gracia — everyone from college classes in the U.S. to trade unions in Honduras. Vargas sometimes wonders if it's all too good to be true. "There is a quote that reads, 'From nice dreams, you wake early,' " she says. "But we don't think like that at Alta Gracia." At the moment, the factory is being subsidized by another Bozich company, Knights Apparel, one of the largest producers of college logo clothing — with contracts in other countries, including Bangladesh. Bozich says those other factories don't pay a living wage, but are independently audited twice a year to ensure safe working conditions. Bozich says he hopes Alta Gracia can be used as a model elsewhere. He says he believes there is momentum building for fair trade or socially responsible clothing. Three years ago, nobody had heard of Alta Gracia, and there was no market for this type of product. "Now, we're in over 800 bookstores around the [U.S.]," he says. "We wouldn't have gone from zero to 807 bookstores if it weren't for the fact that it was working. Consumers are responding. They're buying it." Bozich says prices are comparable to high-end brands. He says he's been approached by some big-name apparel companies — he won't divulge the names — wanting to learn more about Alta Gracia.